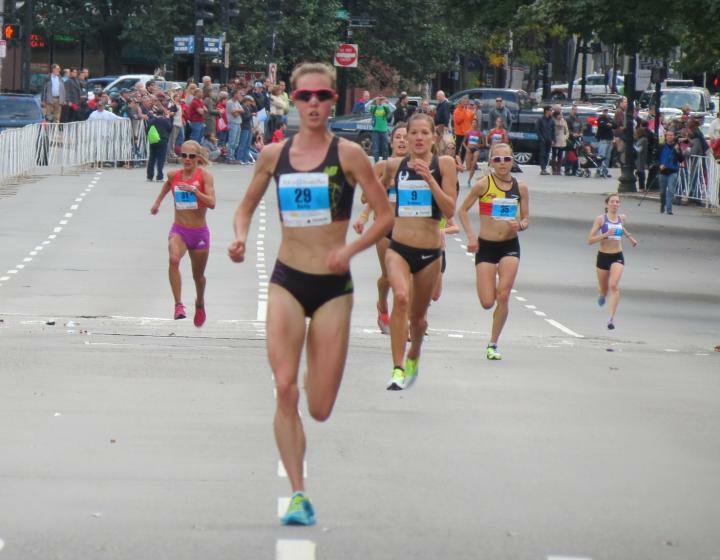 Despite a summer stress fracture that hollowed out her fitness base, Jen Rhines ran a strong 5th today at the USA 10K championship race in Boston, help in conjunction with Tufts Health Plan 10K for Women. The overall race was won by Helen Jemutai of Kenya, who took the race out in mile splits of 4:58, 5:16, 5:15, and 5:19. Rhines was ever-present in the American chase pack and finished in 32:51, 11 seconds in arreas to USA champion Chelsea Reilly (who was running her first-ever 10K). In coming 5th, Rhines beat several race favorites, including Stephanie Rothstein, Katie McGregor, Delilah DiCrescenzo, and Magdalena Boulet. 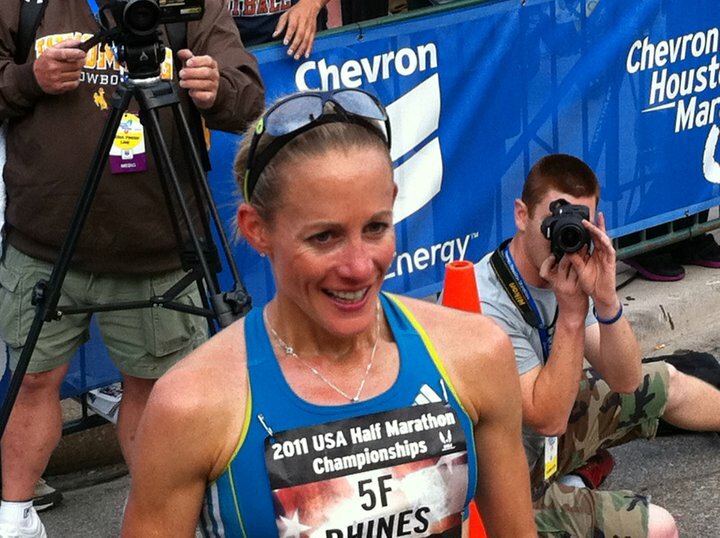 This result for Rhines lends an air of optimism for her fall season as she regains her normal level of race fitness. Rhines ran 32:16 at this race in 2010. 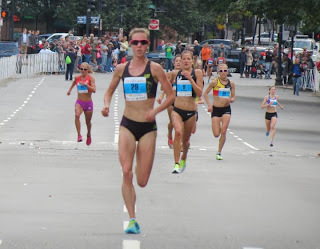 BOSTON (08-Oct) -- Chelsea Reilly made her 10-K debut a memorable one here today, winning the national title at the distance on a crisp fall day at the 36th Tufts Health Plan 10-K for Women in 32 minutes and 41 seconds. Reilly, 23, won a long sprint to the line over Tara Erdmann (32:46), while another 10-K debutante, Neely Spence, finished third (32:51). Reilly also beat her coach and training partner, Olympian Magdalena Lewy Boulet, who finished 15th in the championships in 33:51. "My name is Chelsea Reilly, I'm from Oakland, Calif., I'm coached by Magda Boulet, and I'm with the Bay Area Track Club," Reilly proclaimed to the assembled media, wearing the champion's laurel wreath. "And this is my first 10-K, ever. My first ever, road or track." Reilly, whom Lewy Boulet had recruited to the University of California at Berkeley when she was coaching there five years ago, was part of a 15-woman American lead pack at the half-way point which included Spence, Erdmann, Stephanie Rothstein, Jen Rhines, Katie McGregor and Annie Bersagel, amongst others. Reilly was at the back following her coach's advice: to hang back and wait for a late-race break. "My coach just had me conserve for the first five miles because I had never run one," Reilly explained. She continued: "Tara started to make a move, I matched it, and gave it a go." In the final mile of the 6.2 mile race, Erdmann pushed to the front on Commonwealth Avenue. Reilly followed, then saved her final burst for the finish straight on Charles Street. Reilly was confident that she could win because she recently finished eighth at the Fifth Avenue Mile in New York where she clocked 4:29.0. She also had her own cheering section; her father's family is from nearby Dedham. "I love being in Boston," Reilly gushed. "My family is from Boston; I think I had the most fans out there of anyone." Reilly was actually the second surprise winner here today. Ahead of her, 34 year-old Kenyan Hellen Jemutai took the open title in 32:30, leading from gun to tape. Knowing the prize money for international runners was only available for the first three finishers, Jemutai scooted away from the field right from the gun, blasting through the first mile in 4:58 and the 5-K in 16:03. She was 29 seconds ahead of the Americans at that point. "No fooling around," Jemutai told a reporter when asked what her race strategy was here today. "I just go for my race." Jemutai's victory was noteworthy because she had run yesterday's B.A.A. Half-Marathon where she finished third in 1:13:35. When asked if her legs were tired, so smiled and simply said, "no." Reilly isn't sure which event she'll focus on for next year. She's attracted to the 1500m, but enjoys endurance training, logging most of her miles with Lewy Boulet. In addition to the Fifth Avenue race, Reilly also ran 4:30.18 on the track at the Falmouth Mile last August. Her coach says those mile times didn't come as a result of speed work, claiming that Reilly has natural speed. "She did the mile off her strength," said Lewy Boulet.